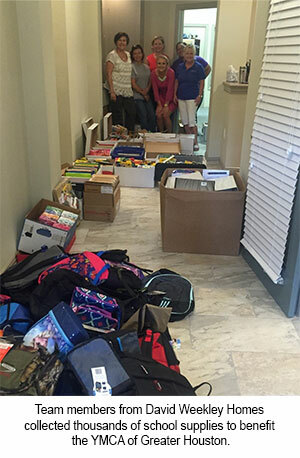 HOUSTON, TX (September 16, 2015): David Weekley Homes hosted a Back to School Supply Drive benefiting the YMCA of Greater Houston, an organization that Houston is focused on putting Judeo-Christian principles into practice by developing programs to build a healthy spirit, mind and body, and nurturing the potential of every child and teen. Thousands of items, valued at $14,000, were collected during the two-week drive, which benefited 1,440 children. After collecting the donations, team members sorted the supplies and delivered them to the organization to ensure the supplies would be distributed in time for the students to begin school with the tools needed to be successful.